Happy Labor Day guys!!! And Thank You Peter J. McGuire and Matthew Maguire for us giving this day off from work!!! We have a Labor Day in France called “La Fete du Travail”, but it is celebrated on May 1st, so quite uncertain of the origins of the American holiday, i googled it today. Did you know that this day only became a federal holiday in 1894? The reason why it became one is because the congress wanted to appease the unrest of the American people after riots erupted when a strike against wage cuts went bad. Well, I learned something today;-) and I much enjoyed this day off. I hope that you too have had a fun week-end! Unlike many of you who probably ran to the beach one last time this year, we decided to stay home to relax and enjoy the beautiful weather that we missed most of the summer. So what have I done? not a lot… I slept late, worked out and had fun with my family doing nothing. And today though we are celebrating Labor Day, I decided that I would not touch my computer and enjoy another lazy day. Because many of you will be hosting a cook-out today, I thought to share a recipe that is very appropriate for a patriotic event such as Labor Day. It is easy, delicious, quick and looks great. 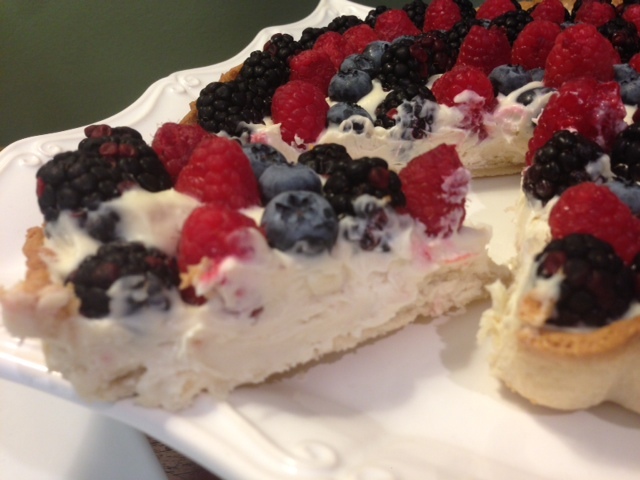 A great dessert for party days such as Memorial Day or even Independance Day. Unfold the pie crust and place it inside your mold. 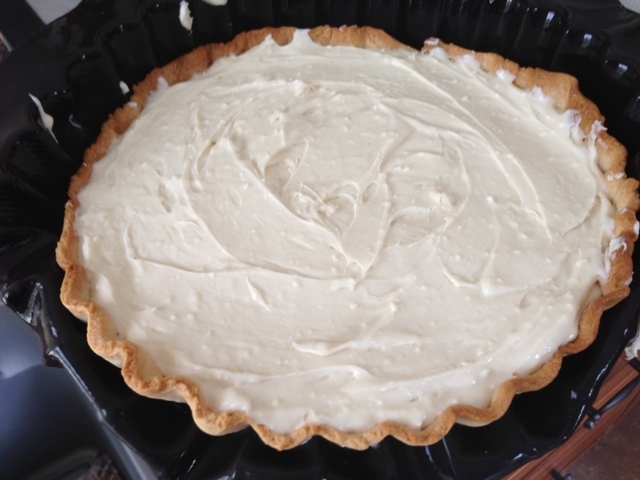 I used the scalloped pie crust, but really the large round mold can work as well. With a fork, prick the bottom of the pie crust so that air pockets will not form while the crust is baking. When the pie crust is baked and golden, remove it from the oven and let it cool completly. In a small bowl, place the white chocolate chips and set aside. In another small bowl, warm up the cream by either warming it up on the stove, or by microwaving it for 1-2 minutes. Pour the hot cream over the chocolate chips and set it aside for at least 5 minutes ( the heavy cream will melt the chocolate chips). With a small whisk, whip the mixture. It should be smooth, liquid and free of lumps. If it is not, place it back into the microwave for 20-30 seconds and repeat until your mixture is free of lumps. Pour this mixture into a kitchen mixer, add the cream cheese and beat the two until you have a thick lump-free cream. 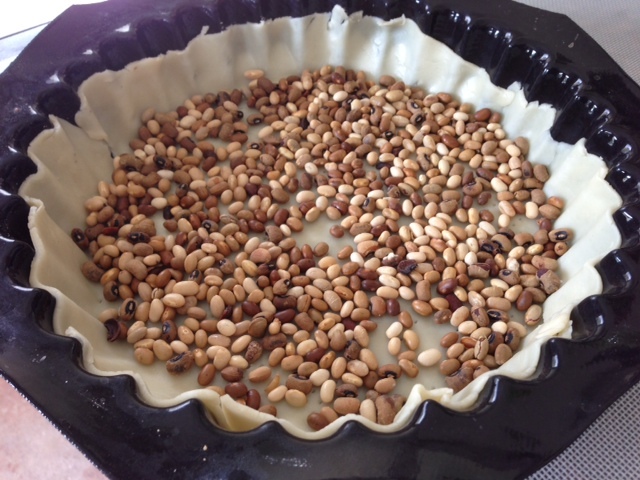 Remove the beans from your pie crust, and spread the chocolate mixture in the pie crust. 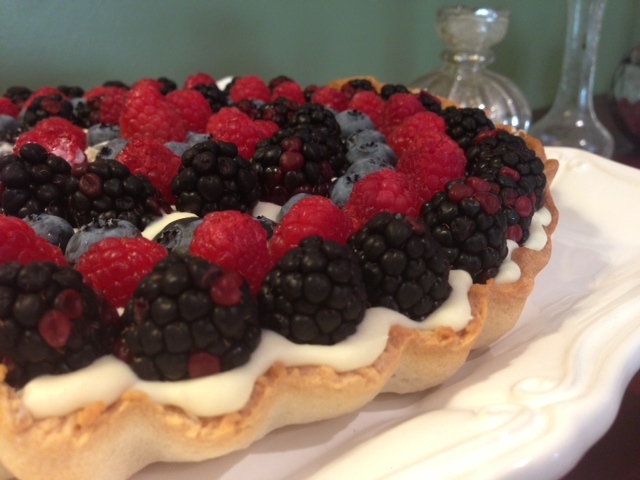 Decorate your pie as you like, I used black berries, blueberries and strawberries. Cool in the fridge for 30 minutes and serve. Yum, Yum!!! Last night I was so busy making phone calls and replying to e-mails that I failed to see the hours pass. Of course, with a family of 3 waiting to be fed still at 9pm, there was not a lot of time left for me to fix dinner. 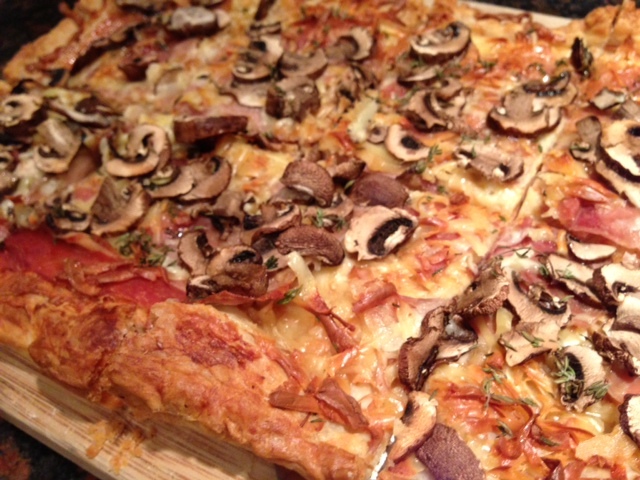 Luckily there is always an array of cheese and cold-cuts in the fridge so that dinner can be fixed in no time. 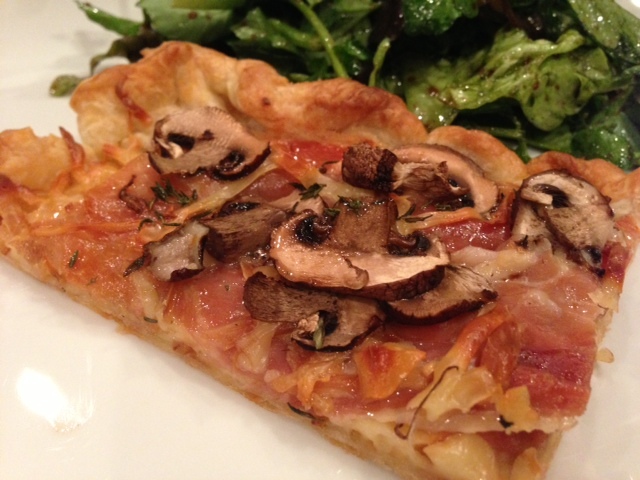 So last night, dinner for my family ended up being a Smoked Gruyere, Proscuitto and Mushroom tart and Mixed Salad. 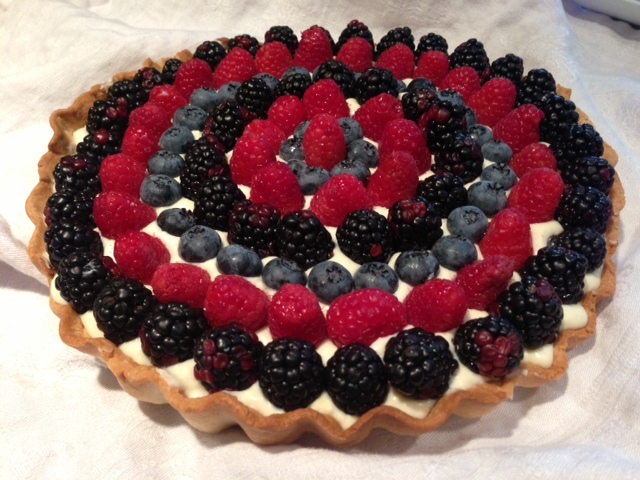 I served this tart as a main meal, but it would make for a fabulous appetizer!!! 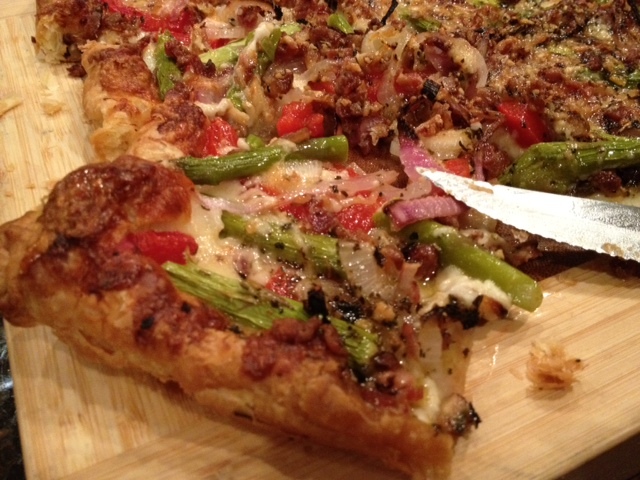 Take the dough out of the freezer and let it thaw out for 30 minutes at room temperature. Place the dough onto the roulpat, and with a rolling pin, roll the dough out to fit the flexipan perfectly. 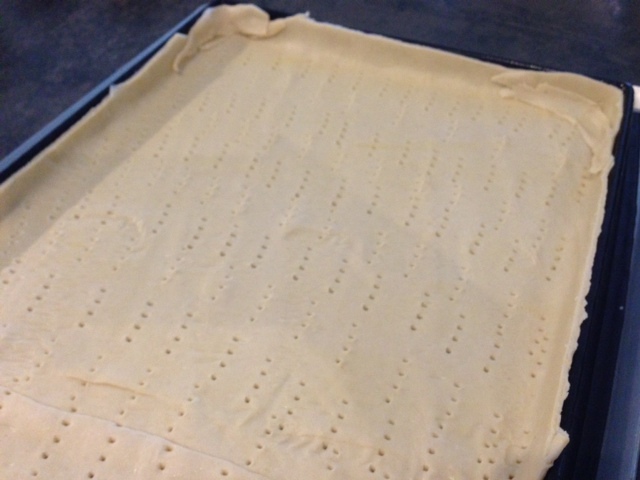 Place the dough onto the flexipan that would have been placed on a medium perforated sheet. 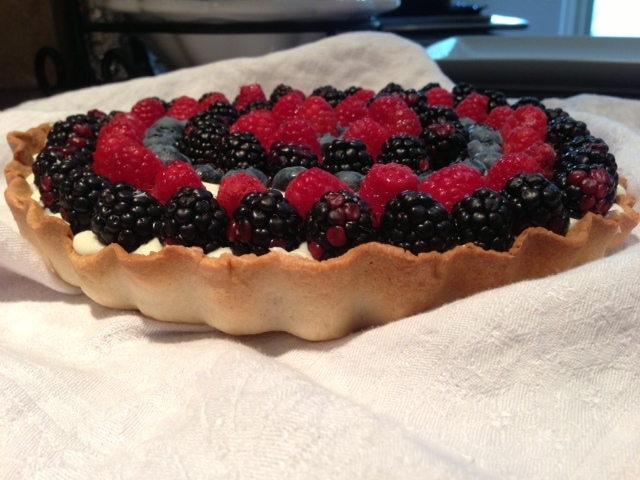 With a fork, perforate the bottom of the tart. Layer 3/4 cup of cheese all over the tart. 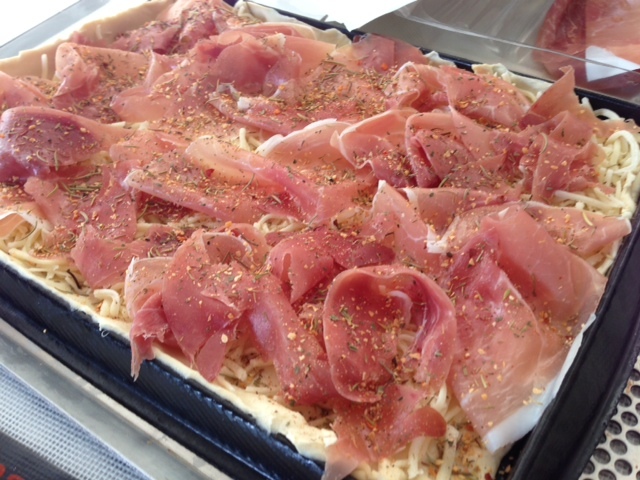 Then place the prosciutto slices. Sprinkle the rest of the cheese. 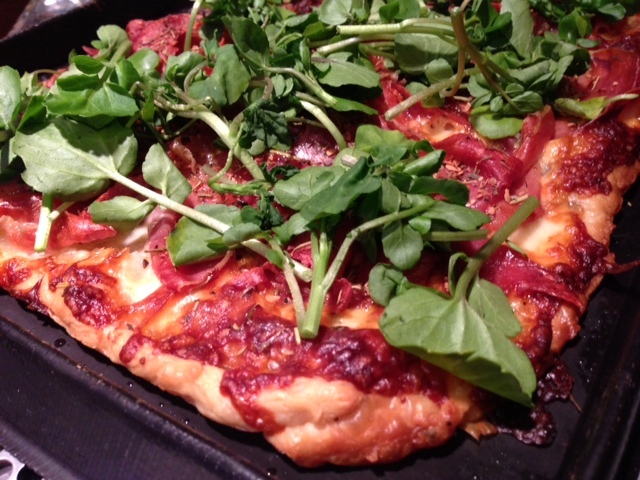 Remove the thyme from the sprigs and sprinkle it all over the tart. 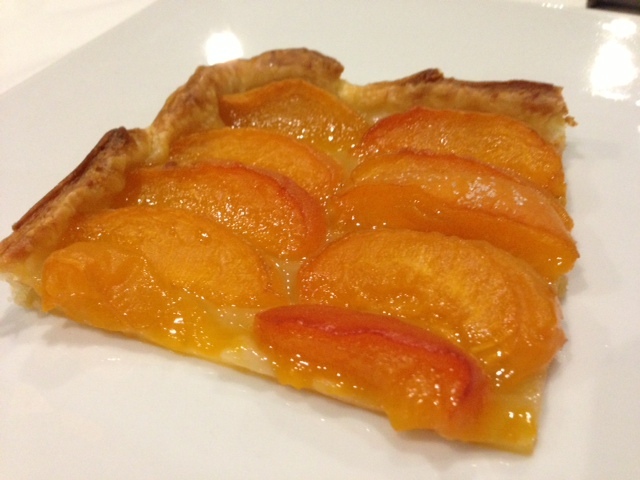 Cook the tart for 20 minutes. Serve the tart with a salad. Well Spring Break is not here yet, and I have still a thousand things to do before I am on vacation: Homeworks, quizzes to review with my child… and the rest of my duties as a mom. Monday was exactly that: a thousand things to do and no time…So of course I did not spend much time trying to fix dinner. I looked in my fridge, and gathered what I had: prosciutto, puff pastry ( yep another one- my fridge is a veritable treasure box). 1 puff pastry sheet thaw out ( 30 minutes to 45 min.) Keep it in the fridge until you are ready to use it or it will become sticky and will not unfold. 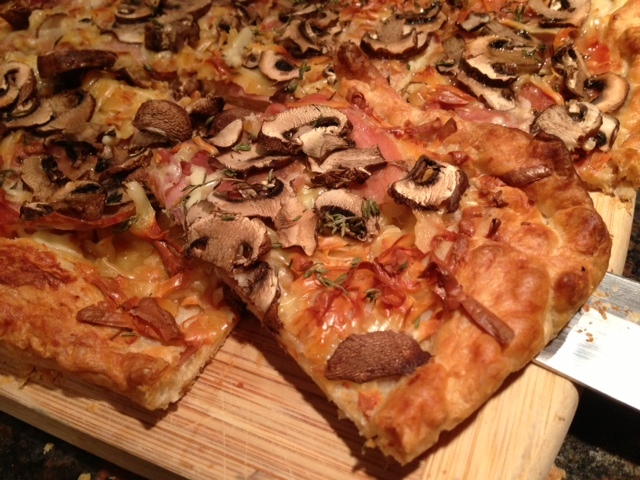 Place the roul’pat on your counter and place the puff pastry on it. Unfold it and with a rolling pin, spread the pastry so that it will fit the flexipan perfectly. With a fork, prick the bottom of the pie. 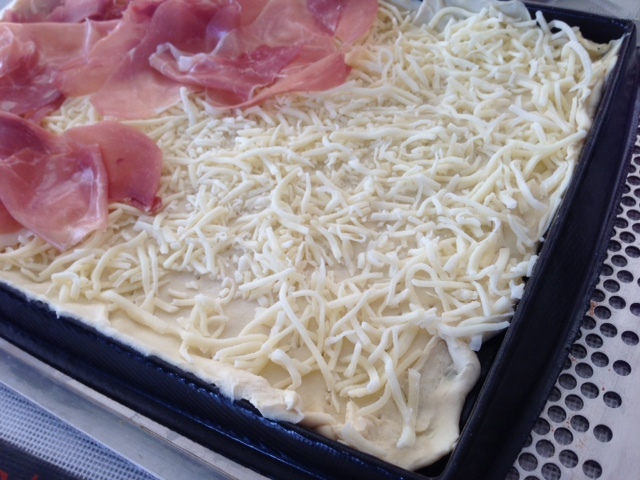 Spread the cheese evenly over the pie dough. 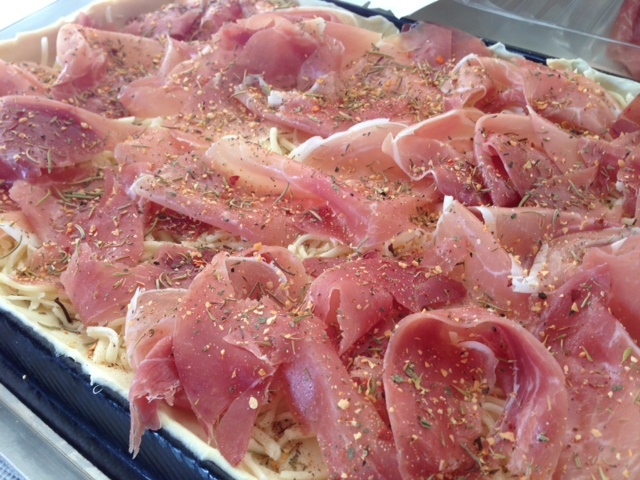 Place the prosciutto all over the cheese, do not lay the sheets flat. I kind of gather them up a bit. 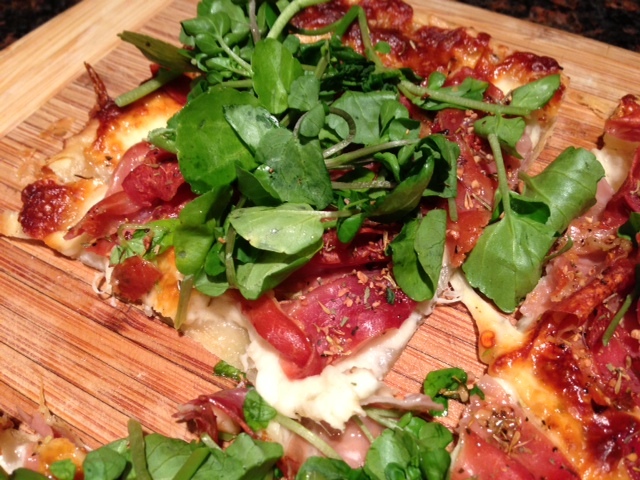 Sprinkle the rosemary herb blend over the prosciutto. 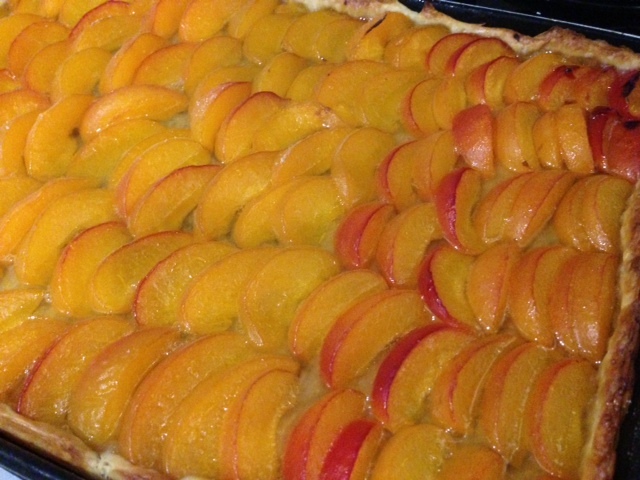 Cook the tart for 15-18 minutes or until the edges are a golden brown. 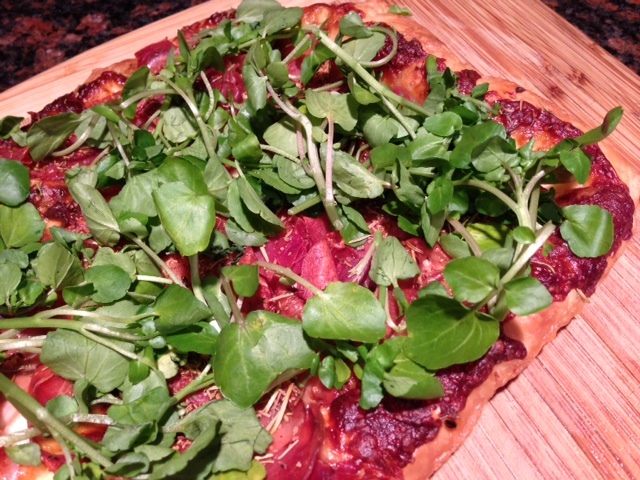 Before cutting the tart, spread the watercress over the tart. 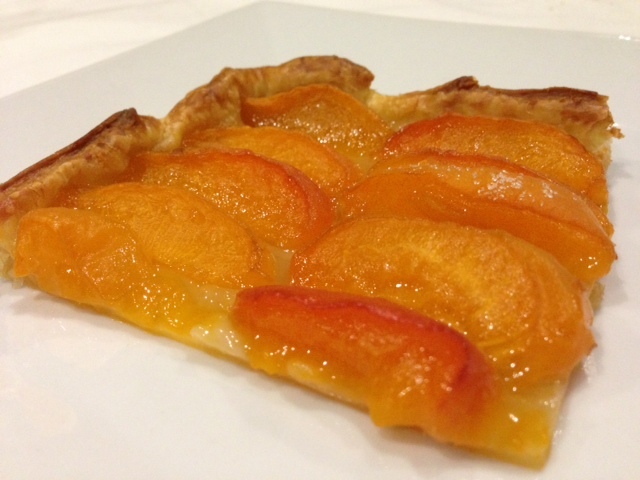 Slice the tart over a cutting board and slice the tart in 8 pieces. 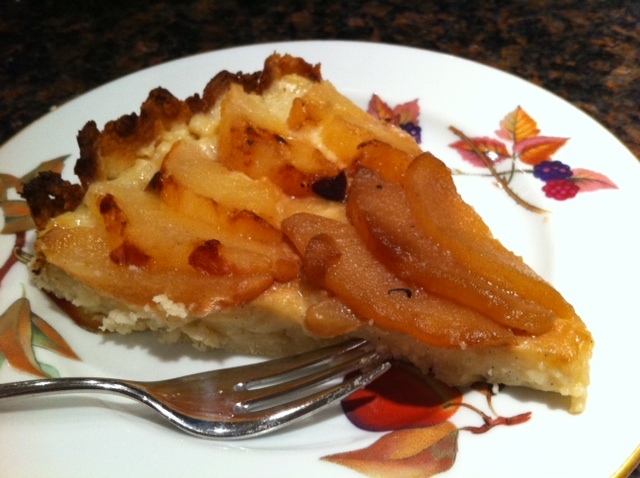 I love pears but I have never found a dessert other than poached pears that I have really liked. So when I saw this recipe of Roasted pear and creme brulee in the Best Baking recipes of Cooking light 2011, I had to try it! And it was very good. Very very light! It is just not an easy recipe since there are so many steps. Ingredients for a large tart tray of 12 inches. Roasted Pears: 4 pears cored. 2 tsp of lemon juice, 1/2 tsp of ground cinnamon, 1/4 tsp of ground nutmeg, 2/3 cup of brown sugar. Place the pears cut side down on a flexipan. In a bowl, mix all the other ingredients and mix well. Sprinkle the pears with the sugar and spices mixture, and bake them in an already warm oven of 450 for 30 minutes or until the pears are tender. Cool completely, remove the skin and slice thinly. The pastry ( Pate Sablee): 8 oz of all-purpose flour, 1/2 cup of butter at room temperature, 2 tbsp of sugar, 1/2 tsp of salt. Place the sugar, salt and flour in a bowl and mix well. Slowly add the butter a little at a time, and mix well until the dough sticks together. 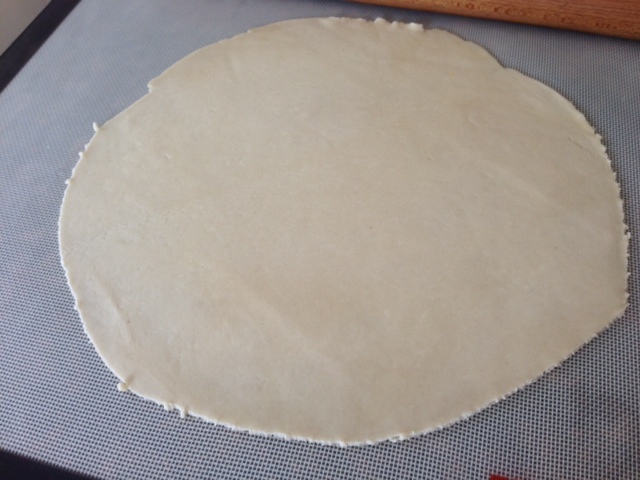 Place the dough on the roulpat, and flatten until it is the size of the tart. Roll the roulpat with the dough on it, and place in the fridge to cool. 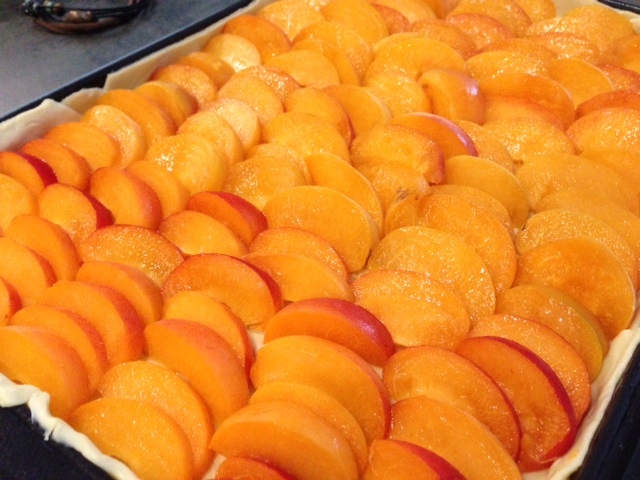 After 10 minutes, take the dough back out, and place it into the tart tray. Perfore the dough to prevent air pockets. Lay baking beads or dry beans all over the dough to prevent the dough to rise during baking. Bake at 450 for 10 minutes. Let it cool. Remove the baking beads or dry beans. Fill with the creme patissiere. Ingredients for the filling ( Creme Patissiere) :3/4 cup of brown sugar, 4 1/2 tbsp of all-purpose flour, 3 cups of fat-free milk or reduced milk, 1 piece of vanilla bean, 2 tbsp of vanilla extract, 2 eggs. Bring the milk, vanilla, vanilla bean, sugar & a pinch of salt to a gentle boil in a pot. In the meantime, whisk the egg yolks and sugar in a mixing bowl until the mixture becomes pale and light. Stir in the flour slowly until it is thoroughly mixed with the egg mixture. Remove the vanilla bean from the milk and scrape the seeds out with the tip of a knife. Drop the seeds into the milk and stir. Pour the boiling milk into the mixture a little by little while whisking continuously to avoid curdling. And then stir in the rest of the milk until the mixture is well combined. Transfer the whole mixture into a pot and heat it under low setting. Stir it constantly with a wooden spoon until it thickens. Once the custard has thickened, take it off the heat, pour it into a clean bowl and let it cool down. Once cooled, cover it with a plastic wrap and refrigerate it until needed. Pour the cream over the dough, and lay the pears over the creme patissiere. Sprinkle with brown sugar, and with a kitchen torch heat the sugar until it caramelizes. Enjoy!! !